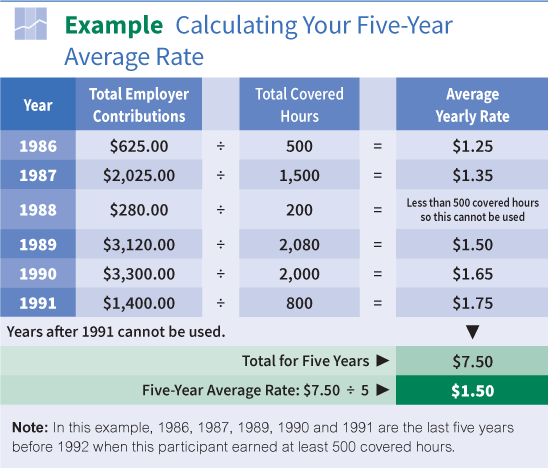 This section explains the benefit you earn under the Plan’s five-year average formula for covered employment before 1987. If you joined the Plan before 1987, you should read this section. If your Plan coverage starts in 1987 or later, you can skip this section (since all of your benefits are earned under the contribution account benefit formula). Under the five-year average formula, you earn a monthly retirement benefit based on your covered hours and past employment, if any, up through 1986. This is called your five-year average benefit. Step 1—Determine your total past and future service credits (up to 33 1/3 total credits). Step 2—Calculate your five-year average rate. 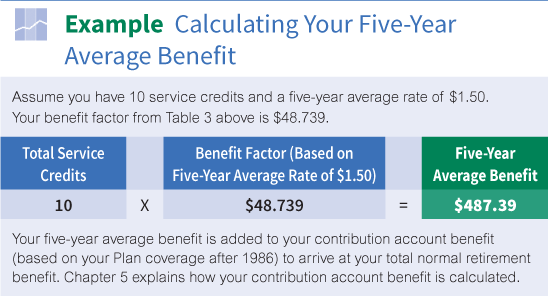 Step 3—Use your five-year average rate to determine your benefit factor. Step 4—Multiply your benefit factor by your total service credits. The result is your five-year average benefit payable at normal retirement age. 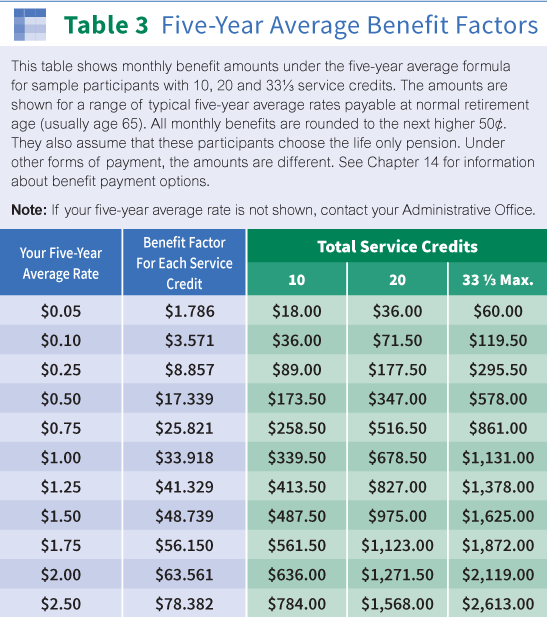 The amount of your five-year average benefit depends on how many service credits you earn. 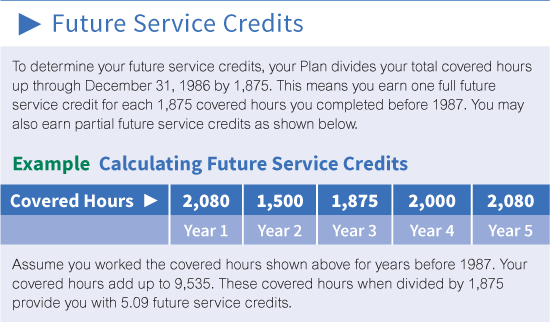 Your service credits are the total of the past service credits and future service credits you earn through December 31, 1986 (up to a combined maximum of 33 1/3 service credits). 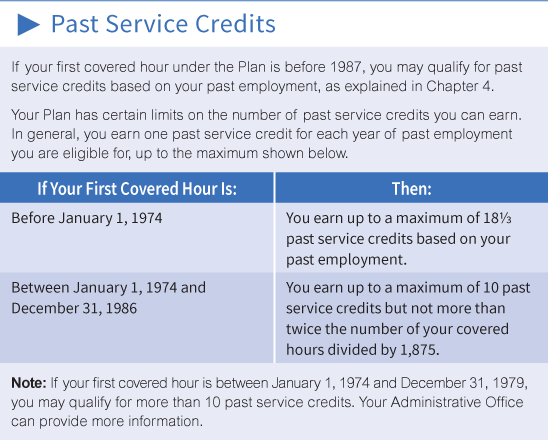 You cannot earn past or future service credits for your work after 1986. Note: Service credits are not the same as years of vesting service and are not used to determine whether you are vested. Click here to determine your Future Service Credits. Click here to determine your Past Service Credits. The amount of your five-year average benefit also depends on your benefit factor as determined by your five-year average contribution rate. Your five-year average rate is the average of the contribution rates paid on your behalf in the five most recent calendar years up through 1991. You must have earned at least 500 covered hours in a calendar year for that year to be used in determining your five-year average rate. For seasonal employees working in the food processing industry, the covered hour requirement is 250. Figure an average yearly contribution rate for each of the five most recent calendar years up through 1991 when you had at least 500 covered hours. Add up the five yearly rates. Divide the total of the five yearly rates by 5. The result is your five-year average rate. If you do not have five years before 1992 in which you had at least 500 covered hours per year, your five-year average rate equals the total contributions made on your behalf up through 1991 divided by your total covered hours up through 1991. Click here for an example of how to calculate your five-year average rate. Your five-year average benefit is based on your service credits through 1986 and your five-year average rate through 1991. Once your five-year average rate is calculated, the next step is to determine the benefit factor for that rate. To find your benefit factor, click here to look up your five-year average rate. The benefit factors shown in Table 3 apply if you are an active Plan participant at any time since 1985. If you do not meet this requirement or if your five-year average rate is not shown, contact your Administrative Office to find out your benefit factor. To complete the calculation of your five-year average benefit, multiply the benefit factor that applies to your five-year average rate by the total service credits you earned. The result is your five-year average benefit. There are special rules to calculate benefits for those who have not been active Plan participants since 1985. If you think these rules apply to you, contact your Administrative Office. Click here for questions and answers about Five-Year Average Benefit.